Many thanks for those who dropped me well wishes comments and emails. I am getting better now and praying hard that I am on the road to recovery. After six sessions of acupuncture, it seems to be improving. At least now, I can somehow sit through a meal and was able to cook simple dishes. I still need alot of bed rest but now the pain is manageable. It helps too with friends visiting me to kill the boredom. Thanks buddies! Actually being an active me, lying down is just plain "torture" for me but I know I have to be a good girl and really take this opportunity when hubby is around to really rest for next week, he will be on the road again and I am on my own again. 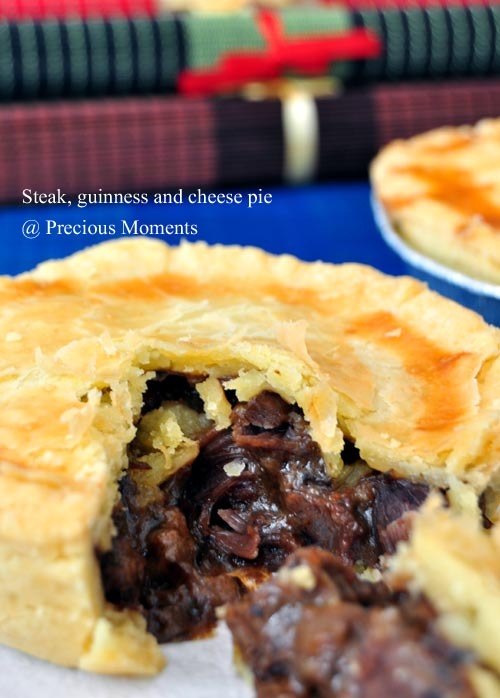 Now I wanted to share this awesome tasting Steak, guinness and cheese pie that I done few days back. You can easily do this in one morning or afternoon but I split it into two days' preparation because I didn't want to stretch myself. These days, seems like this is the easiest and fastest way to serve dinner. I actually prepared the filling first. I tried using charcoal to slowly braise the beef and it turned out to be the right choice. Just love the melt in the mouth feel. Also gives me in between breaks to rest my back. Since we really like the texture of the chicken pie crust minus the sweetness, I decided to replace the puff pastry as recipe stated with this and omitted the sugar. This time round, I make it thicker as I was afraid that the Steak, guinness and cheese filling will be too soggy and soak through the crust. The dough is really easy to handle and thus makes my life really simple. I was able to get the dough together very quickly. Rest it in the fridge while I rest my back as well. After the fillings had been cooled down, it was time to roll out the dough. I even used disposable pie foil to save the hassle of washing. As this dough recipe isn’t a sticky dough, I was able to roll and shape it into the foil easily. My helper helped me to fill up the pie. Roll another piece of dough to cover up and glaze it quickly. By the time I rest my back again, the pies were already baking in the oven. I love the crust because I don't have to waste time blind bake it first and yet it yield a really flaky crust! Am pretty satisfied by the overall result. Son’s comment was to add a little bit more salt. Try it, it is really delicious! and easy! P.S: The background table mats were gift from my son who visited Vietnam during the June school holiday. I might be crazy to participate in this event given my condition but since I am at this, why not have some fun. Heat wok, drizzle a little oil. Stir fast onions first and then garlic till fragrant. Add beef and browned it. Add the vegetable, herb and mushroom. Give it a quick stir. Pour in Guinness, bring to a boil and let it simmer till soft. The stew is rich and dark. Add water along the way if meat is still not done. Once meat is tenderised, mixed a little water with the flour. Bring up the heat and stir in the flour solution while stirring. The sauce should thicken and season with salt and pepper. Add in the cheese and stir till cheese completed melted. Set aside to cool. For dough, I used the Easy chicken pie's recipe. Hi Edith, I got to know that you had hurt your back till so jialat and glad to hear that you are getting better. Take care and wish you are able to ran and jump again very soon. The pie looks delicious, the filling is so inviting. Hi, I'm dropping by via Cook LIke A Star. I hope you'll recover soon. I must be difficult to take care of the family when one is not well. The pie looks very delicious! 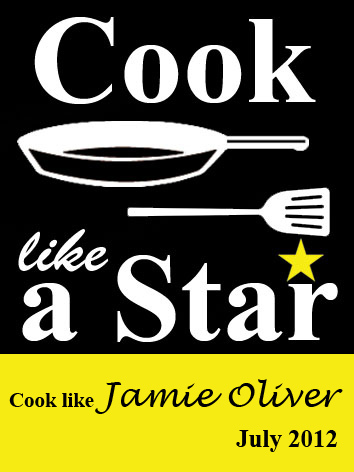 Another great JO recipe. Hi Edith glad to hear that you are recovering well. i too also have back problem and elder son probelm like you and your blog give me a lots of encouragement and also inspire me. Thanks. Would like to say a prayer here which i read this morning. "Dear living God, i thank You for Your sovereign control over life's events. On behalf of Your dear servant, i ask that You would give Edith deep peace. I pray for the physicians as they apply their medical skills, that You would give them excellent results. May Your healing hand touch Edith and bring her back into full service for You. In Jesus' name. Amen"
Hi Edith, glad to hear that you are recovering well. That's a nice pie, will try it out ;). Me too also have back problem and elder son problem which make me feel very delight to tour around your blog, i'm not good in writing and therefore, most of the time i use to veiw blog only ^-^. i came across a prayer this morning and would like to pray for you. "Dear living God, i thank You for Your sovereign control over life's events. On behalf of Your dear servant, I ask that You would give Edith deep peace. I pray for the physicians as they apply their medical skills, that You would give them excellent results. May Your healing hand touch Edith and bring her back into full service for Your. In Jesus' name. Amen"
Jess, 5 years ago, I got a similar problem, went for the ops but have side effect. This time round, I am seeking alternative treatment and hopefully on the road to recovery. Thanks 饱满人生 for your prayer. Deeply appreciated. Hey Edith ! Hope you're doing well and take care always ! :) Your kids are very lucky to have you ! Glad that you could bake this delectable pie ! God be praised! You sound better since your pie looks sooo delicious! These very British-style pies looks very delicious. I think you are really fantastic baking these even with your recovering state. The pie looks so yummy! I am happy to know you're getting better now.. It must be so boring having to lie down on bed for long, I remember I had to bedrest too during my 2nd pregnancy for 5 months, it's such a torture! Thanks Anne, I am also bless to have my kids. Yes busygran, meals are now prepared on interval progress. Zoe, I am hope you are feeling better too. SAHM cannot fall ill.
Alice, Thanks for the prayer. Oh my, your second pregnancy sounds bad. Glad that you make it through.